Term insurance is a type of policy offered by an insurance company that provides coverage for a specific period of time. For instance, if a policyholder has a term insurance policy of 30 years, he/she will get coverage for those 30 years. Once the policy expires, any coverage the policy offers will be void, meaning the coverage stops altogether. With this plan, policyholders are entitled to choose how their nominee will receive the benefits. Life Option - The entire lump sum is paid out of the death of the policyholder or the diagnosis of a terminal illness. Future premiums will be waived if the policyholder is totally and permanently disabled as a result of an accident. Extra Life Option - The entire lump sum is paid out of the death of the policyholder or the diagnosis of a terminal illness. Future premiums will be waived if the policyholder is totally and permanently disabled as a result of an accident. In addition, an extra sum will be paid if the policyholder dies in an accident. 3D Life Option - The entire lump sum is paid out of the death of the policyholder or the diagnosis of a terminal illness. Future premiums will be waived if the policyholder is totally and permanently disabled as a result of an accident. Premiums are also waived upon diagnosis of 34 critical illnesses. Lifelong Protection Option - Get protection for your whole life but pay premiums only till the age of 65 years. The entire lump sum is paid out of the death of the policyholder or the diagnosis of a terminal illness. Future premiums will be waived if the policyholder is totally and permanently disabled as a result of an accident. 3D Life Long Protection - Get protection for your whole life but pay premiums only till the age of 65 years. The entire lump sum is paid out of the death of the policyholder or the diagnosis of a terminal illness. Future premiums will be waived if the policyholder is totally and permanently disabled as a result of an accident. Premiums are also waived upon diagnosis of 34 critical illnesses. Return of Premium Option - If the policyholder survives the policy term, the total premiums paid will be refunded. The entire lump sum is paid out of the death of the policyholder or the diagnosis of a terminal illness. Future premiums will be waived if the policyholder is totally and permanently disabled as a result of an accident. Income Option - The entire lump sum is paid out of the death of the policyholder or the diagnosis of a terminal illness. Future premiums will be waived if the policyholder is totally and permanently disabled as a result of an accident. The monthly income will be paid out either at a level rate or increasing rate for a period selected by the policyholder while taking out the policy. Extra Life Income Option - The entire lump sum is paid out of the death of the policyholder or the diagnosis of a terminal illness. Future premiums will be waived if the policyholder is totally and permanently disabled as a result of an accident. The monthly income will be paid out either at a level rate or increasing rate for a period selected by the policyholder while taking out the policy. In addition, an extra sum plus extra monthly income will be paid if the policyholder dies in an accident. Income Replacement Option - Upon the death or diagnosis of a terminal illness of the policyholder, the plan will pay out 12 times the monthly income. Premiums are waived if the policyholder suffers total permanent disablement due to an accident. The monthly income will be paid out either at a level rate or increasing rate for a period selected by the policyholder while taking out the policy. This term plan provides benefits of lump sum payouts and monthly income options to take care of your loved ones once you are no more. The plan is flexible with options to increase the cover at certain milestones of life. Life Option - The death benefit is as mentioned above, payable as a lump sum. Extra Life Option - The death benefit is as mentioned above, payable as a lump sum. In addition, an extra sum will be paid if the policyholder dies in an accident. Income Option - 10% of the death benefit will be paid out as a lump sum. The remaining 90% will be paid out as monthly income over a period of 15 years. Income Plus Option - 100% of the death benefit is paid out. In addition to this, the nominee will receive a monthly income of 0.5% of the sum assured for a period of 10 years. The policyholder can choose to provide a level income or an increasing income at 10% p.a. Flexible policy terms between 5 and 15 years. The premium payment is equal to the policy term. Premiums can be paid monthly, quarterly, half-yearly and yearly. Maturity Benefit - There are no survival benefits. Surrender Benefit - There is no surrender value of the policy. Why should you buy a Term Plan from HDFC Life? Term plans come with plenty of benefits which make them one of the most preferred insurance policies. To begin with, they are extremely affordable, offer large coverage, and they provide a lump sum payment to the nominees/beneficiaries in case the policyholder dies. 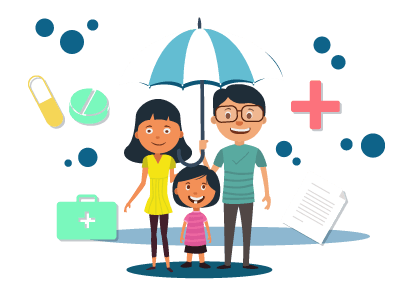 HDFC Life, one of the largest insurance provider in the country, offers a few term insurance plans for its customers. These plans, also called Protection Plans, offer death benefits to the beneficiary listed out by the person insured.